UN's human rights official condemns Israel for "war crimes", cites its failure to share Iron Dome with the "governing authority" of Gaza. In what may be one of the most ridiculous accusations yet against Israel, the UN's top human rights official condemned Israel on Thursday for failing to share the Iron Dome anti-missile system with Hamas, Breitbart reports. "There is a strong possibility that international law has been violated, in a manner that could amount to war crimes,” Breitbart quoted Pillay as saying following a meeting of the UN Human Rights Council on Gaza. She backed this statement by citing Israel’s refusal to share its Iron Dome ballistic missile defense shield with the "governing authority" of Gaza. Just because Hamas fires rockets indiscriminately aimed at Israeli civilian population centers without provocation and fires them from within its own population centers does not “absolve” Israel from its own legal violations, Pillay told reporters, according to Breitbart. Pillay failed to mention that the Iron Dome was developed in order to save the lives of innocent civilians from Hamas’s endless rocket attacks against Israelis. The Iron Dome is designed to intercept rockets that are fired towards populated areas. It has proven very effective and its success rate was listed as 90% in 2012. According to Breitbart, Pillay also condemned what she termed Israeli "targeting" of UN-run schools and hospitals in Gaza. She did not mention, nor was she reminded by any of the reporters present, that at least three UN-run schools in Gaza have been used as rocket warehouses, a gross violation of international law that clearly falls within the category of war crimes. "What I'm seeing now is a recurrence of the very acts that the Gaza fact-finding mission indicated as constituting war crimes and crimes against humanity," she said. 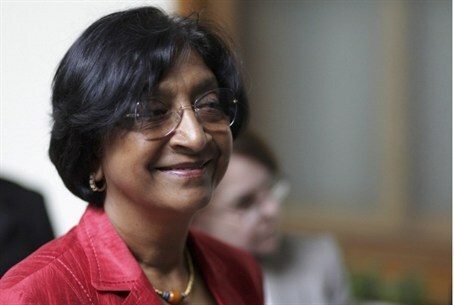 While the claim regarding the Iron Dome is a new one, Pillay’s latest comments are certainly not the first time she has condemned Israel for “war crimes”. Just last week, Pillay opened an emergency UN debate on Gaza by saying there is a "strong possibility" that Israel is violating law in Gaza, and that could amount to war crimes. She said the killing of Gaza civilians, especially children, raises concerns on Israel's precautions and respect for proportionality.